When coupled with ScanTools Plus scanning utility software, you can develop scanning applications with ease. ScanTools Plus requires no special knowledge of programming languages. It is menu-driven, using wizards to guide you through the steps of developing an "application definition." With it you can maintain files and define scan forms–plus scan, edit, store, validate, and display data. The software can also convert files into commonly-used formats required by other software packages. For added convenience, operators can choose to start or stop the scanning process via a key on the processor keyboard or a single READY button on the document transport. 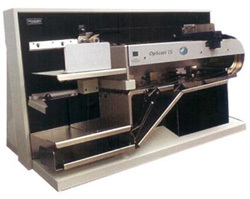 The OpScan 15 scanner allows access to the roller assemblies and read heads so they can be periodically cleaned and paper dust/chaff removed. Reader performance is constantly monitored and specific reasons for halts are immediately displayed to the operator.